This original copy of The Irish Proclamation sold for 96,000 at Adams today. 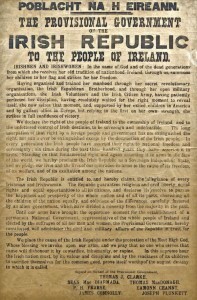 An original print copy of the 1916 Proclamation sold for 96,000 at James Adam in Dublin today. 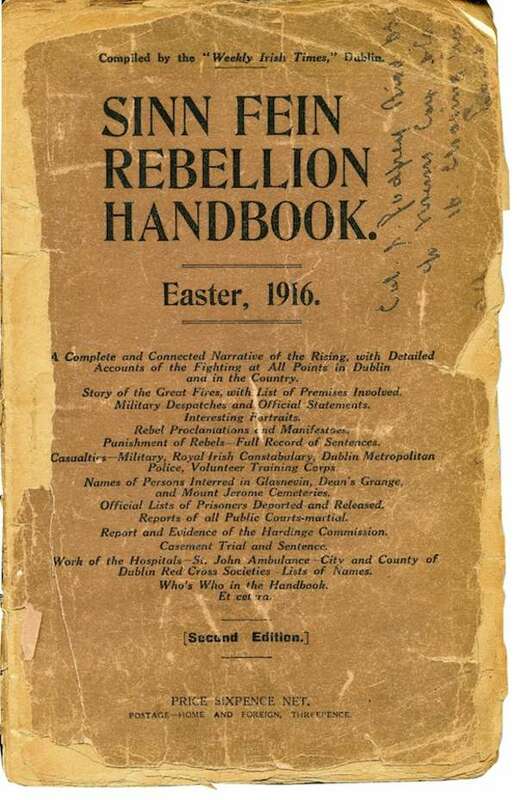 The Proclamation of the Provisional Government of the Irish Republic to the People of Ireland was printed at Liberty Hall on the evening of Sunday, April 23 and read by Patrick Pearse outside the GPO, Dublin on the morning of Easter Monday at the start of the Easter Rising. 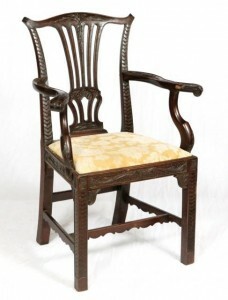 The paper was of poor quality but this copy, which is glazed, had been professionally repaired. 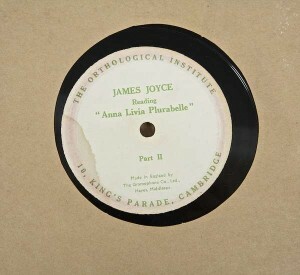 It is believed that no more than 50 copies of the first printing have survived. 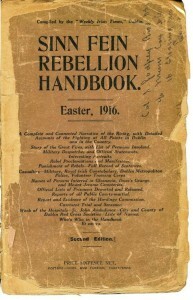 The text was printed under armed Citizen Army guard at Liberty Hall using paper bought by James Connolly for his Workers’ Republic and a font of type borrowed from a nearby printer. 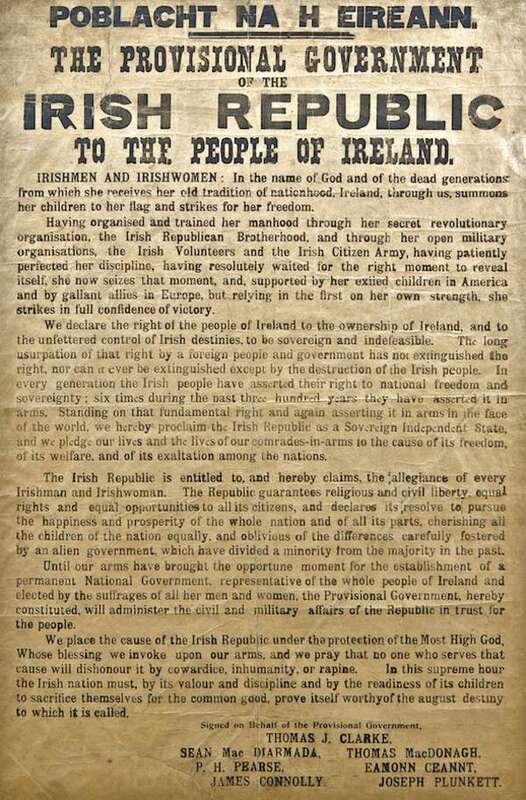 The Proclamation of the Irish Republic, recognised as the founding document of modern Irish nationhood, was drafted probably by Patrick Pearse, possibly with amendments by Thomas MacDonagh and James Connolly. The original manuscript has never been found. 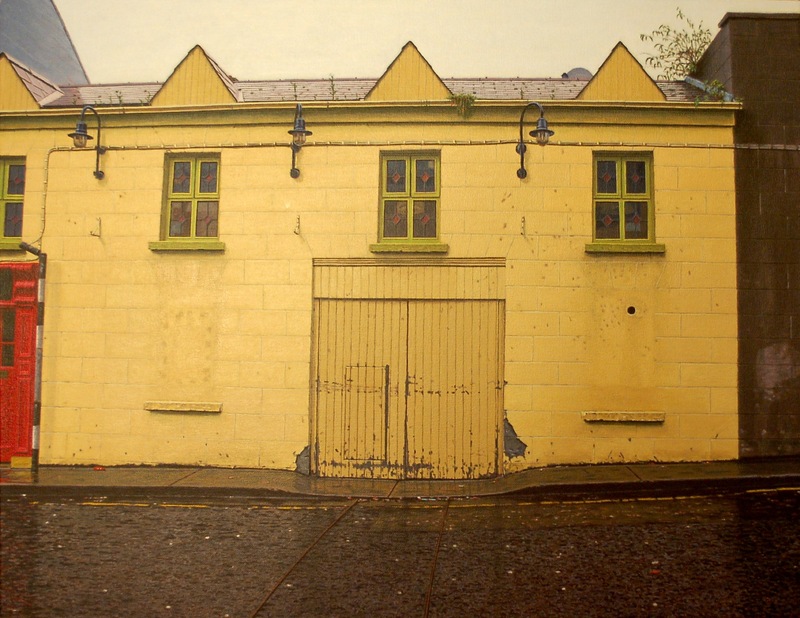 This one is believed to have been originally in a house in Harcourt St. which was at one time a ‘safe house’ for Michael Collins. (See post on antiquesandartireland.com for April 24, 2013). Art, furniture and collectibles will come under the hammer at Dolan’s house contents auction on the premises at Costelloe Lodge, Costelloe, Connemara on Bank Holiday Monday May 6 at noon. A total of 449 lots will be offered. Built as a fishing lodge in the 19th century it famously became the home of J. Bruce Ismay, chairman of the White Star Line. A survivor of the Titanic disaster and villified on both sides of the Atlantic Ismay retired and lived here in the 1920’s and ’30’s. He died in 1937. Agnes and Jack Toohey bought the Lodge in the 1980’s. She was a dress designer and sportstwoman who fenced for Ireland and designed Olympic uniforms for successive Irish teams. 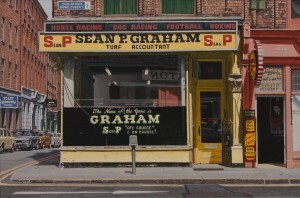 An exhibition by photo realist artist John Doherty has just opened at the Taylor Galleries at Kildare St. in Dublin. 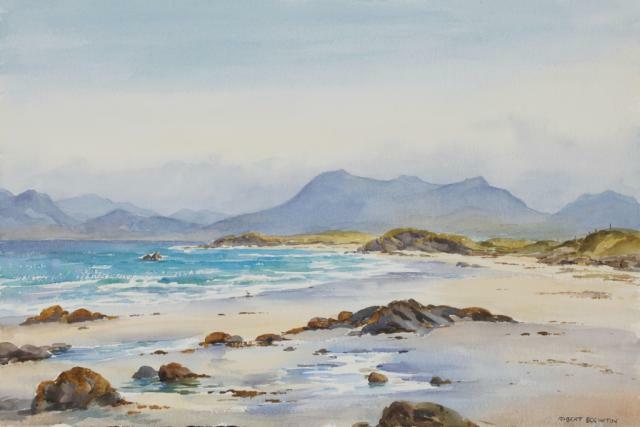 “Recent Paintings” is his 11th solo show at a gallery which is celebrating its 35th anniversary this year. 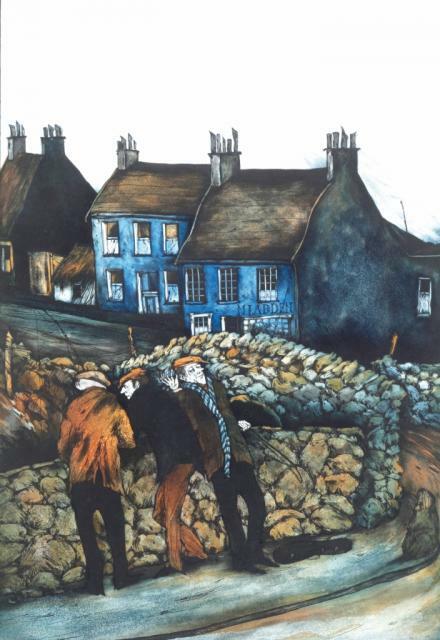 Doherty’s images, which have proved to be popular in the salesrooms, point towards the human stories that exist behind the facades of places and things, and bring the past back to life. 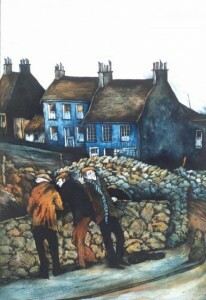 Born in Kilkenny in 1949 he studied architecture at Bolton St. before moving to Sydney to pursue a career as an artist. 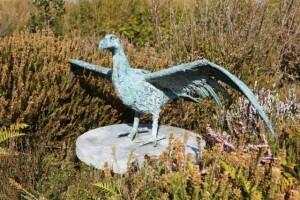 He has shown widely in Ireland and Australia and his work is included in the collections of the National Gallery of Victoria, the Institute of Modern Art in Chicago, the Irish National Stud collection, AIB Dublin and London and Artbank Sydney. The show at Taylor continues until May 18. (Click on either image to enlarge). ‘The Yellow House’ by John Doherty from his show at Taylor Galleries. It is priced at 10,000. 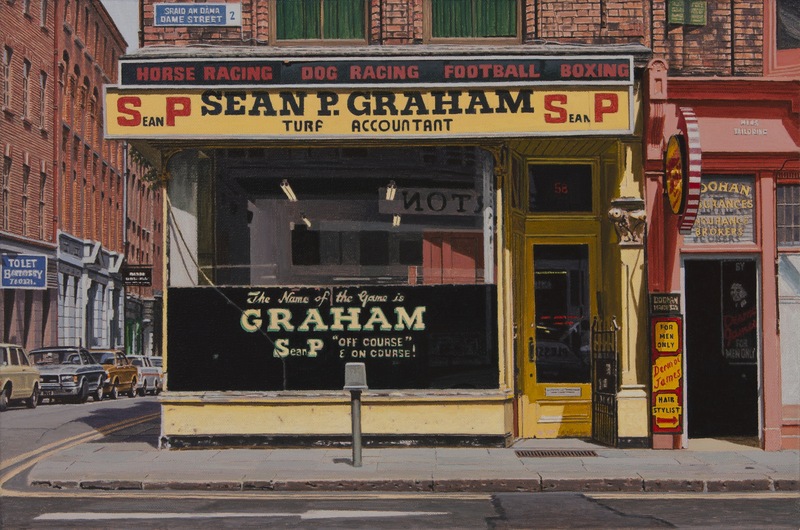 S-P is the title of this work by John Doherty from his show at Taylor Galleries, Dublin. It is priced at 7,000. THIS 1860 panoramic view of Beijing comes up at Sotheby’s in London on May 14. The sale of Travel, Atlases, Maps and Natural History will include some of the earliest photographs of China including views of Dagu (Taku) and Beijing (Peking). The images were taken by Felice Beato during gut Second Opium War. These photographs reveal a forgotten China and illustrates landscapes and cityscapes now changed almost beyond recognition. The panorama of Beijing is the most remarkable of the 18 photographs in this collection. It was taken from the wall of the city on October 24, 1860, revealing the interior and the Forbidden City beyond. The album includes images of the Imperial Winter Palace and the Imperial Summer Palace. The photos are estimated at £100,000-200,000. UPDATE: THE ALBUM MADE £218,500. 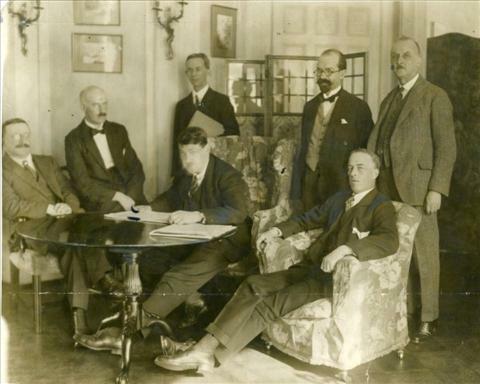 This old press photograph of the Anglo-Irish Treaty negotiations of 1921 made 1,300 at Limerick Auction Rooms. An extremely rare 1921 image of an important piece of Irish history sold for 1,300 at auction in Limerick on April 24. Billed as a possibly unique visual of the Anglo Irish Treaty Negotiations the picture shows Sinn Fein delegates to the negotiations. Michael Collins is seated centre at the table and looking towards the camera in this early press photograph. There are two dates on the rear, October 11th 1921 and December 22. 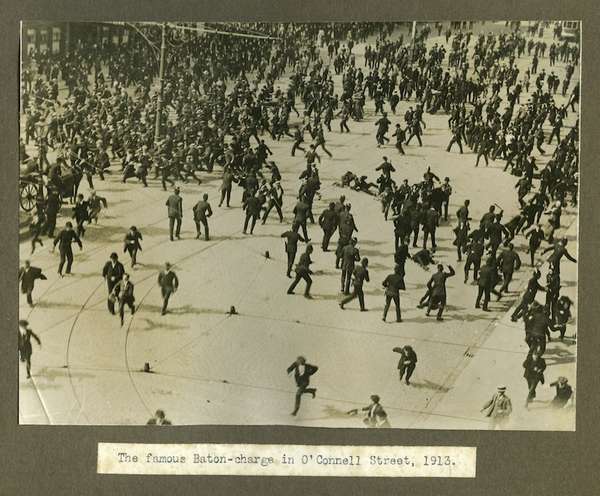 The agreement, which provided for the establishment of the Irish Free State with an opt out clause for Northern Ireland, was signed in London on December 6, 1921. It concluded the Irish War of Independence. 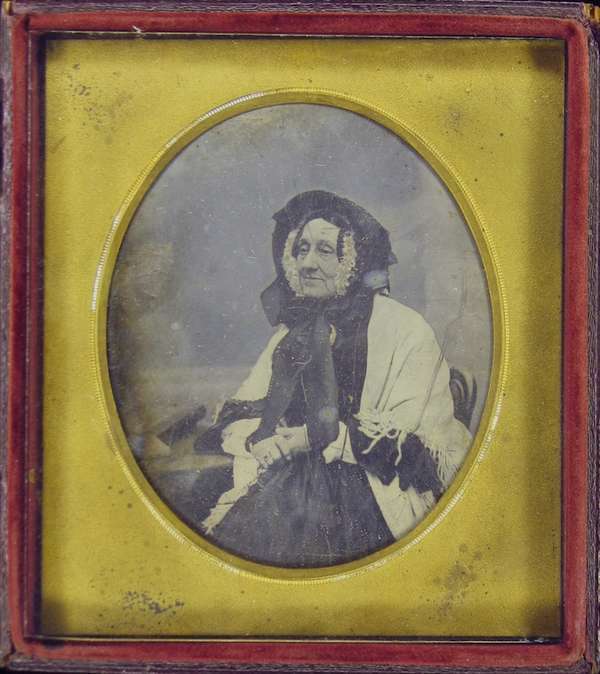 The image came up at Limerick Auction Rooms as part of an archive of press images. (See post on antiquesandartireland.com for March 29, 2013). The Romany Reading caravan at Mealy’s. UPDATE: THIS MADE 22,000 AND WILL STAY IN IRELAND. An early gypsy caravan by Dunton and Sons of Reading – possibly the earliest surviving Dunton wagon – is the main lot at Mealy’s pre-summer fine and decorative art sale in Castlecomer, Co. Kilkenny on April 29. John Barker, author of “Romany Relics the wagon album” dates it to around 1895 as there is no skylight and there are turned pillars in the bed space. The fireplace is a later addition and the wheels are not original. The caravan is 13 feet long and 6’8″ wide. It is painted in red and yellow and decorated with stylised flowers. There is a hay rack and storage cupboard to the rear and three up and down sash windows. The front and rear porch brackets have open scrolls and vines and are flanked to each side with lion head gargoyles and two brass and painted metal coach lamps. 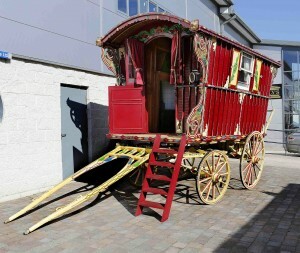 The Romany Reading Vardo or gypsy caravan is estimated at 20,000-30,000. A collection of Royal Doulton toby jugs (200-300). THESE MADE 180. THE sale of 800 years of Irish Political, Literary and Military history at James Adam in Dublin on April 30 contains much of interest to a wide variety of collectors. There are 699 lots and the catalogue is on-line. Here is a small selection. 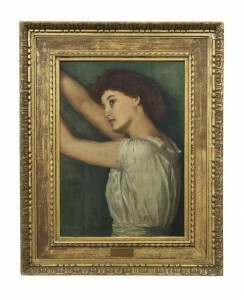 Portrait of Lily Langtry by George Frank Miles (1852-1891) (2,000-4,000). UPDATE: THIS MADE 3,800. 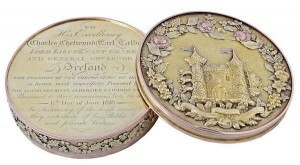 A George III Irish freedom box, Dublin 1816 (15,000-20,000). UPDATE: THIS WAS UNSOLD. 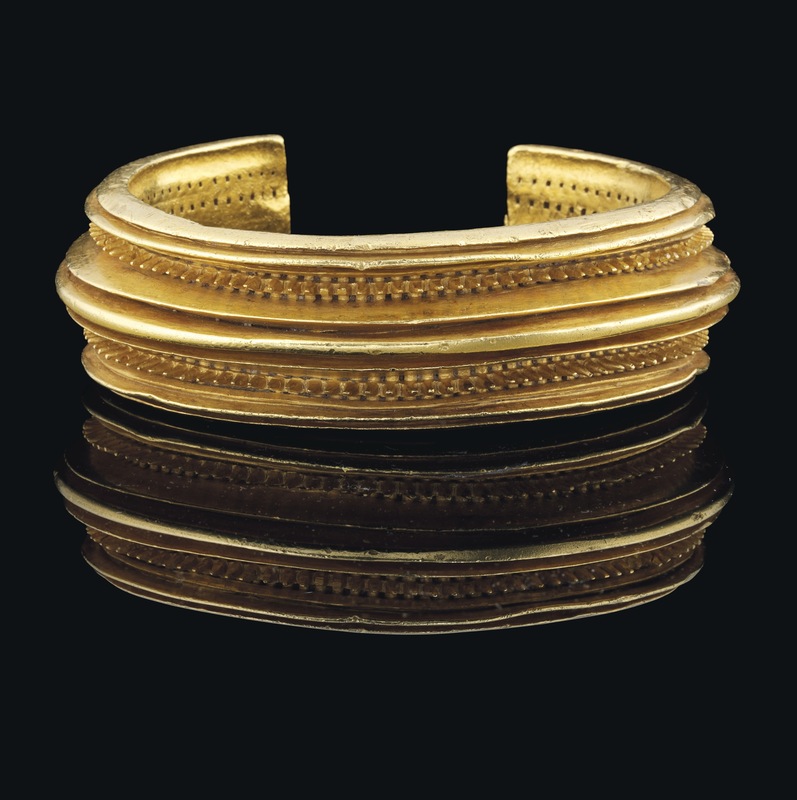 A CELTIC SOLID GOLD BRACELET IRON AGE, CIRCA 1000 B.C. 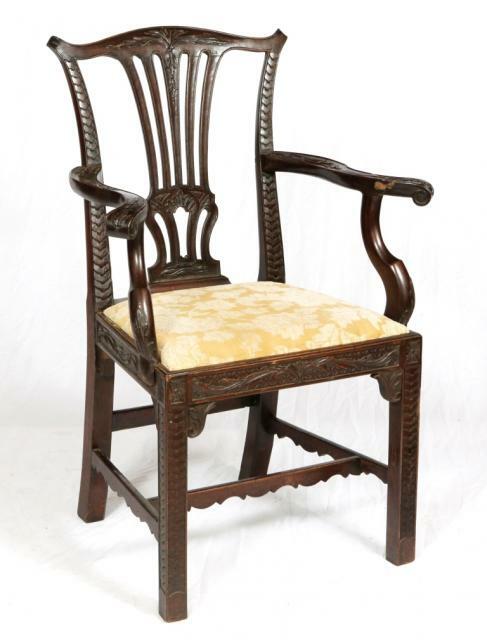 courtesy Christie’s Images Ltd., 2013. (Click on image to enlarge). UPDATE: IT MADE £517,875. This exquisite solid gold Celtic bracelet originally discovered in Portugal comes up at Christie’s sale of antiquities in South Kensington on May 2. 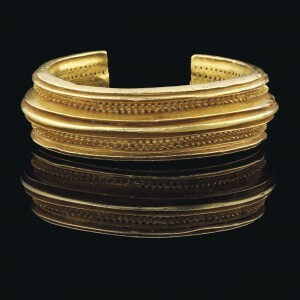 Measuring three and a quarter inches in diameter the heavy gold bracelet made about 3,000 years ago is believed to be on the only one of its type still in private hands. It weighs 599.5 grams and is on the market for the first time. The estimate is £40,000-60,000. The intricate geometic pattern demonstrates the technological advances of the Iron Age. The new use of iron around 1,000 B.C. 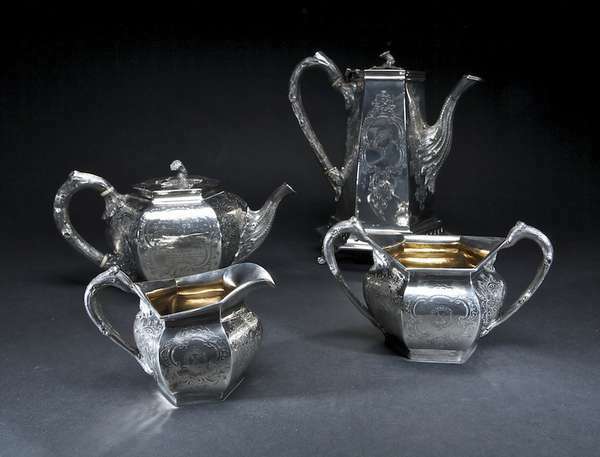 brought two huge benefits to goldsmiths, furnaces capable of melting large masses of gold and tools made from iron that allowed more ambitious and bold designs. A number of museum quality pieces of Celtic craft were discovered in Portugal during the mid 20th century. Laetitia Delaloye of Christie’s said; “The gold bracelet from the Iron Age is a special piece and it is extremely rare for us to see such a detailed example of early Iron Age craftsmanship on the market.” The auction features work that embrace the cultures of Egypt, Greece, Rome and the Near East. UPDATE: IT made £517,875 in an auction which brought in £4,241,775 and was sold 94% by value and 88% by lot. 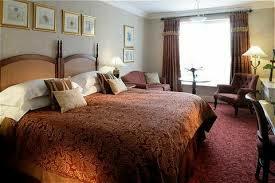 A bedroom at the Montrose Hotel. 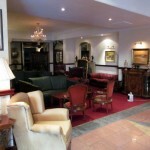 A view of the interior of The Montrose Hotel. 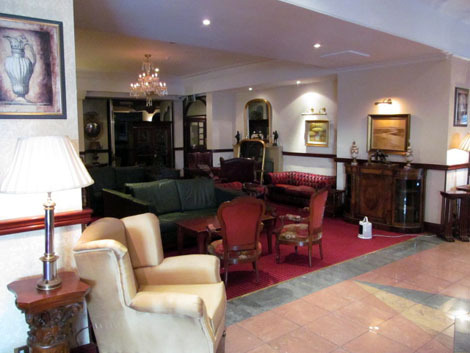 The no reserve sale of contents from the Montrose Hotel, Donnybrook, Dublin on April 27 features 3,500 lots. 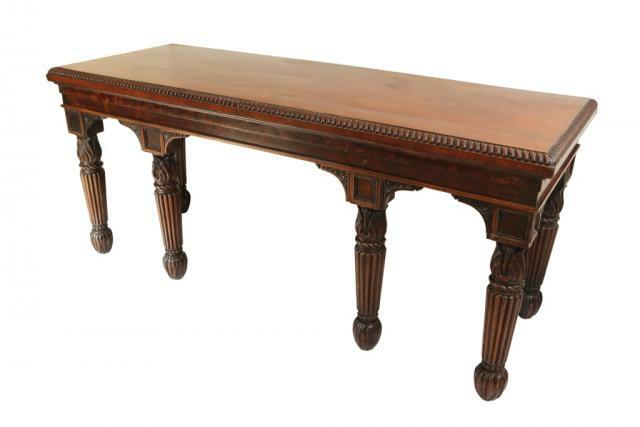 Among them are three large Waterford chandeliers, two Empire style chandeliers, twelve leather settees, 200 club and tub armchairs, 40 gilded mirrors, curtains, beds, catering and conference equipment and even a mahogany brass bound and carved bar counter. 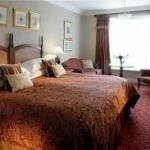 The Montrose, one of Dublin’s best known hotels, was opened in 1964 by legendary hotelier P.V. Doyle. It was the first hotel in the Doyle Group. 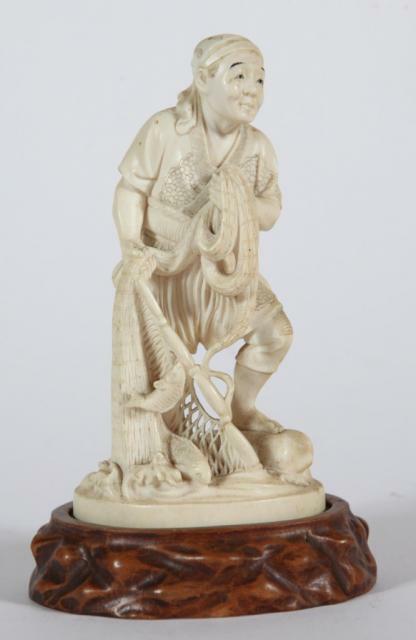 The no reserve sale will be conducted by Matthews Auctioneers. © 2013 Barnett Newman Foundation / Artists Rights Society (ARS), New York (Click on image to enlarge). UPDATE: IT SOLD FOR $43,845,000. 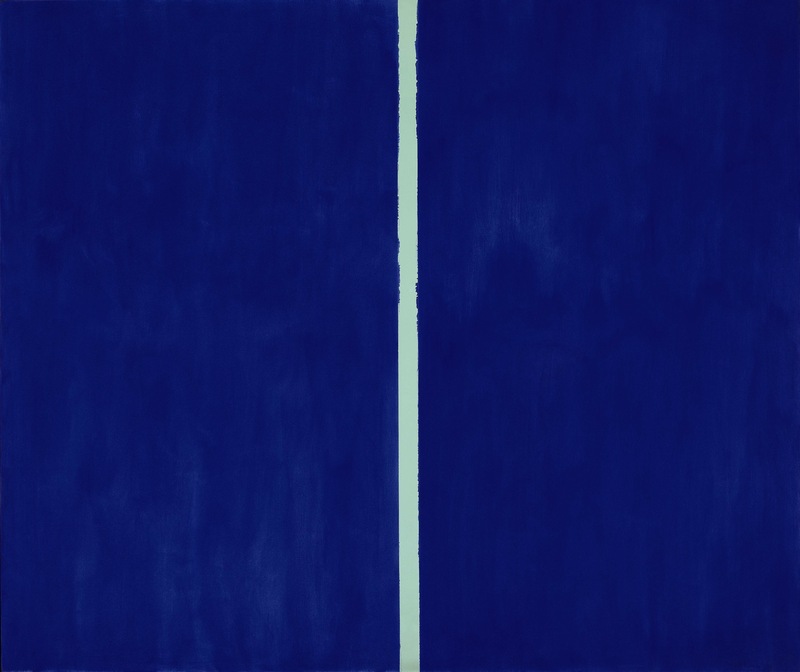 THE most important painting by Barnett Newman ever to appear at auction comes up at Sotheby’s in New York on May 14. Onement VI stands as a masterwork of the entire Abstract Expressionist movement. 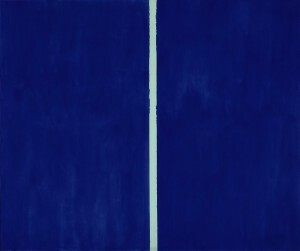 Of the six paintings in the series two are in the Museum of Modern Art, New York, one is at the Wadsworth Atheneum, Hartford and one at the Allen Memorial Art Museum, Oberlin College, Ohio. UPDATE: IT SOLD FOR $43,845,000.